NATco understands having dynamic packaging is key to increasing sales and staying ahead of competitors. NATco provides cost-efficient solutions that offer the most compelling visual interest to the consumer. Our structural design and engineering team creates cutting edge retail packaging. We are equipped with state-of-the art prototyping equipment to execute your custom packaging requirements with speed and innovation. 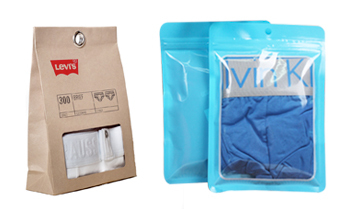 NATco can produce pouches with different materials depending on the final use. Most common materials are vinyl, cotton, nylon, polyester, poly-cotton and others. 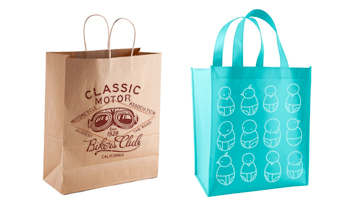 NATco designs and produces a wide variety of Poly Bags; plain or printed up to 8 colors. These bags can be finished with adhesive re-sealable /re-closable flaps, sealed locks, hook and loop, snap, or zip locks; with or without gussets. For peg hanging, bags can be supplied with different styles of hangers or just a punch hole. A wide variety of materials including PE, PET, EVA, and other polymers are available in different thicknesses, with clear or laminated finishes. Our bags are specifically designed for the retail market considering the target public as well as the image that needs to be communicated. These bags are produced using different qualities of paper or plastic, in any shape or size, and can be printed with up to 6 colors. NATco’s Packaging Design & Engineering Department will create the right shape for your product, whether that’s a plastic box, a clamshell, or a blister adhered to paperboard. PET boxes are a very popular alternative to paperboard/corrugated packaging when attempting to increase the visibility of the product without exposing it. Environmentally-friendly materials, such as APET and RPET, can also be used in this type of packaging. Clamshell packaging and blisters can be direct-printed, or can include a paperboard insert, or both. These can also be produced in a variety of materials, including environmentally-friendly ones. NATco designs and produces printed and/or blank cartons for different packaging purposes, utilizing different materials, such as paper, plastic, vinyl, and others that vary in width. 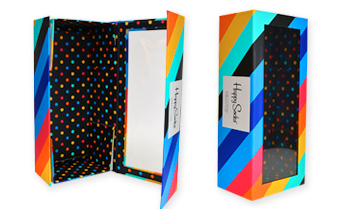 The cartons are designed in accordance with the product that will be boxed inside and the options are endless, from the design to the shape and size. Clear windows on the carton will display the content making it easier for the customer. Plastic hangers can be tacked or attached to the back of the box to give it a unique touch. Many of these can be finished with adhesive tapes to ensure a sturdy fold. Our designs allow for facilitated assembly and mechanical locking for top and bottom. Commonly used with transparent containers, boxes for apparel, or home products. As far as graphics, we can add pictures of the items that are within the package and additional information inherent to the product. 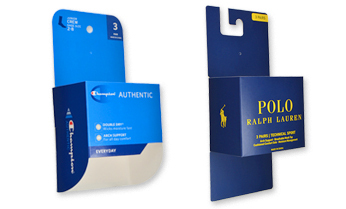 These inserts can be displayed from inside the box by sliding it on the front, front and back, sides or all around the product. 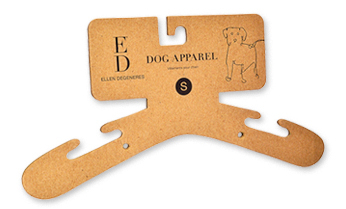 Designed to fold around the product, these are intended to hold a set of clothing garments together while still advertising the product. Merchandise varies in weight and size, which is why our creative packing team will find the correct dimension to showcase your product in a sustainable way. Headers can simply be transformed into hanger cards by adding a hook to the header for a more dynamic look. 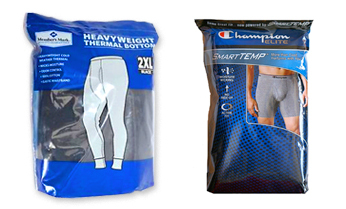 Belly bands are specially designed to present a set of products, such as a pack of undershirts or socks. Each band is specifically designed for each product, varying within the desired marketing target. There is a wide array of options from paper to synthetic materials that can be used to make your product stand out from others. The bands can have a simple design or an elaborate one showcasing any of the client’s needs. Mass retailers need to display and move their products at the store in a timely manner. 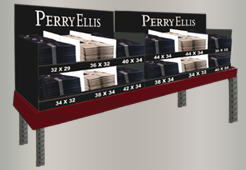 Trays can be used as a means of transporting products from inventory to shelves while still being designed to advertise the product they hold. The trays can have divisions to separate the products being displayed and could be designed and produced in many different lengths and heights. 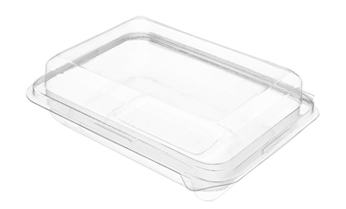 The outside and the inside of these trays can be printed to showcase the containing brand and product. PDQ stands for “Pretty Darn Quick”. This structure is conceived to display the products as a “Floorstand” or “Stand Alone” and it could be also placed on a pallet. It is devised to support heavy weight and for long standing. Divisions and shelves can be built to better store the products. These are a great displaying tool at retail stores. Engineered as stackable self-supporting trays, it can be displayed also just a single unit. Constructed with one frame with built-in shelves and divisions, it could be shaped at will. The most usual material is corrugated board and it can printed in order to maximize its visual power. 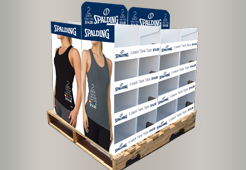 The POP Displays (Point of Purchase) are created to stand in a limited amount of space and to have a strong visual impact on the shopper as they walk through.